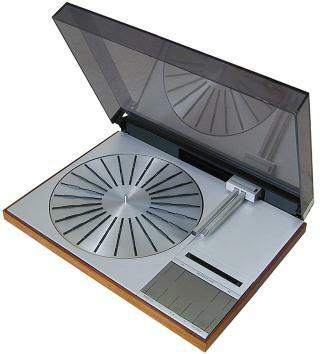 A quadraphonic turntable for use with the Beomaster 6000. In most respects, Beogram 6000 was identical to Beogram 4002, the difference being that the components needed to decode CD4 quadraphonic records were fitted, so that the machine provided 4 discreet outputs, equalised and raised to line level. When a CD4 record was being played and successfully decoded, a “CD4” indicator, positioned between the two speed control dials, lit up in red. A small switch allowed the decoder to be switched out if necessary. The MMC 6000 pickup had a stylus of special multi-radial “Pramanik” geometry, and was classed by RCA (the originators, along with JVC, of the CD4 system) as of the highest performance grade. Text copyright © Beocentral. Unauthorised reproduction prohibited. The Beogram 6000, with its special pickup and Beomaster 6000, formed a CD4 quadraphonic system of the very highest quality, but even this was not enough to prevent quadraphony disappearing into obscurity, and once the need passed, Beogram 6000 disappeared too. Text copyright © Beocentral. Unauthorised reproduction prohibited.